Airborne Media, Rock Systems and provider of fully integrated RF accelerated life-test/burn-in test systems for compound semiconductor devices, Accel-RF, are uniting to develop systems that permit smartphone users to privately listen to televisions in public venues. The firm says this marks the integration of its various teams, including ChipX and Endwave subsidiaries, under a single Quality Management System. Breakthroughs In LED Technology Increase Beam Angle Range. The engineering team at Gem Hsin Electronics is turning heads with its new patented innovations which use laser-precision technology to create direct paths for heated air to escape to the heat-sink. Osram’s power Topled is equipped with nanostack technology and has two compound semiconductor p-n junctions that are grown one on top of the other. The firm expects its Laos and new Korean facilities will be instrumental in allowing 5N Plus to meet increasing demand for its products in this part of the world. Contrary to conventional ideas, researchers say they have demonstrated that the key to boosting solar cell efficiency is not in absorbing more photons, but emitting more photons. At the Core Partner Convention, the firm was honoured for its modules for high speed 40G and 100G systems. The Copper-Indium-disulphide semiconductor on long reels of Copper Tape (CISCuT) have been independently tested. The new approach means that an optical fibre taper waveguide captures some of the larger fraction of the gallium arsenide quantum dot’s emission which is trapped in the compound semiconductor. 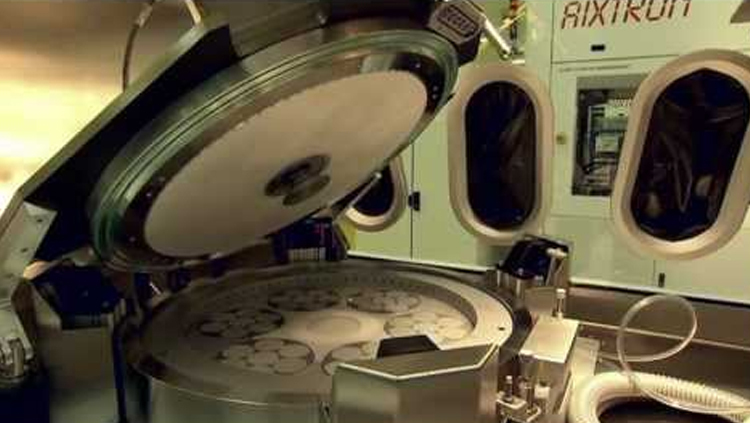 The reactor, optimised for cost effective LED manufacturing, is configured so that the only part that needs to be exchanged is the susceptor plate. What’s more, only very minor process tuning factors need to be applied to transfer processes from CRIUS II-L to the new platform. The firm has been awarded for its innovative RF technology solutions and Sony Ericsson considers theTriQuint to be an important partner in delivering its mobile communications products. Third-party testing of the Cree LR24 luminaries against the proposed linear fluorescent found that the LED luminaires emitted 44 percent less heat. The LEDs also contributed a 15 degree rise in ambient temperature rather than the 25 degree increase from the fluorescents when compared to a baseline of no lighting. The decline is partly due to pricing pressures caused by the weak demand of outdoorstreet lighting in China, together with the overcapacity of backlighting that has spilled over into the general lighting market. The firm will present its latest innovations on Tuesday, November 15, 2011 at 9:30 am Eastern Time. The pioneer of blue gallium nitride LEDs has been recognised for his outstanding contribution to research in the field. The firms have successfully completed, what they say, is the world's first Terabit optical transmission based on 500 Gigabit per second (Gb/s) super-channels using indium phosphide based devices. The firm’s gallium arsenide based multi-junction solar cells will be used in a spaceship which is to orbit the moon. The new kids on the block, diode lasers, can produce high-quality white light using a four-colour laser source and could challenge LEDs for home and industrial lighting supremacy. China and Taiwan are still the largest markets for the firm’s products used in compound semiconductor manufacturing. JM expects its GPT PureGuard V-Purge System sales to be strong in 2012 based on the fact that long-term LED market opportunities remain very positive. Customers will gain knowledge on how to maintain and run their own machines on a day-to-day basis. The project, which involves the use of the firm’s cadmium telluride solar modules, will support local businesses and boost the economy in Western Australia. The firm will build, operate and maintain the cadmium telluride PV power plant in Los Angeles County and the project will create 250 construction jobs. The firm has however postponed the commissioning of its cadmium telluride solar cell Vietnam factory although total production throughput is expected to reach 70 MW/line annually by the end of 2012.